Can this all-in-one desktop PC entertain everyone? The Acer Aspire Z5763 knows the deal: all-in-one (AIO) PCs aren't supposed to be masters of all things, they're slimline entertainment boxes. We all know that they are usually weak in the processor and more importantly the graphics department, but that doesn't mean they need to hide from the limelight. 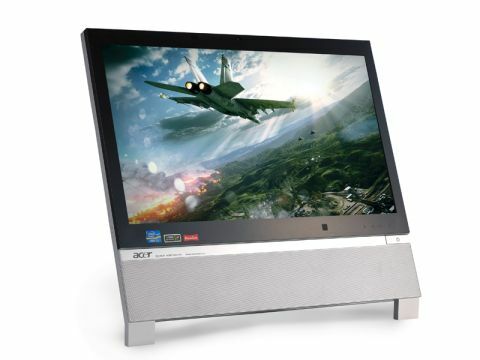 This all-in-one proudly struts its credentials, this is a 23-inch entertainment system that boasts a 1080p resolution and a Nvidia 3D-ready screen with Blu-ray 3D support. Thankfully this comes preinstalled with Windows 7 64-bit, so you can make the most of your 4GB of RAM. Integrated wireless-N and Gigabit LAN provide network access and the matching silver-styled mouse and keyboard manage a coordinated look. On top of this it also boasts a Kinect-style camera-based motion control system that uses the integrated webcam. It's an intriguing cherry on an iced cake. No-one tries to pretend that an all-in-one is going to replace your desktop for every task, while there are powerful models out there the majority lack processor and 3D graphics power. In that respect the Aspire Z5673 is no exception. We have no issues with the Sandy Bridge Core i3 2100 3.1GHz CPU, it's able for the entry-level market with Intel shaving off a few features, such as Turbo Boost and AES instructions, it still retains Hyperthreading, plus Quick Sync Video and purrs along with any internet or office productivity tasks. More annoyingly is the weak Nvidia GT 435M mobile graphics. The real reason for the Nvidia chipset is the Blu-ray 3D-ready display. You're not going to be playing any 3D games, but the 1080p 23-inch panel with its 120Hz refresh puts on an excellent show. Its anti-glare matt finish performs well under most lighting conditions and with the built-in Nvidia 3D Vision kit made for an easy set up. Even the sound was acceptable but lacked any mid- or high-end punch, cranked to 10 it was loud enough with no distortion. An interesting addition is the Clear-fi media software, which provides basic media controls that can be manipulated with hand gestures. It sounds like an excellent idea and the detection in use is surprisingly accurate, the issue for us is there's no flexibility in the software. Controls are restricted to a bare minimum of media buttons and only work with the Clear.fi software and Windows Media Player. For media entertainment and desktop work then the Aspire Z5673 is a solid workhorse. The 1TB drive and 4GB of memory should prove adequate for a good number of years and even the Core i3 shouldn't tire too soon. The 3D performance though is sadly lacking and the motion control system is too limited in its current state. We also found the number of ports limiting too as there's no additional video out, though there is an internal DVI port that's screwed shut. Sadly it just ends up as an expensive, and fairly limited desktop for the price of an enthusiast build. If you want a 3D Blu-ray machine there are cheaper alternatives.